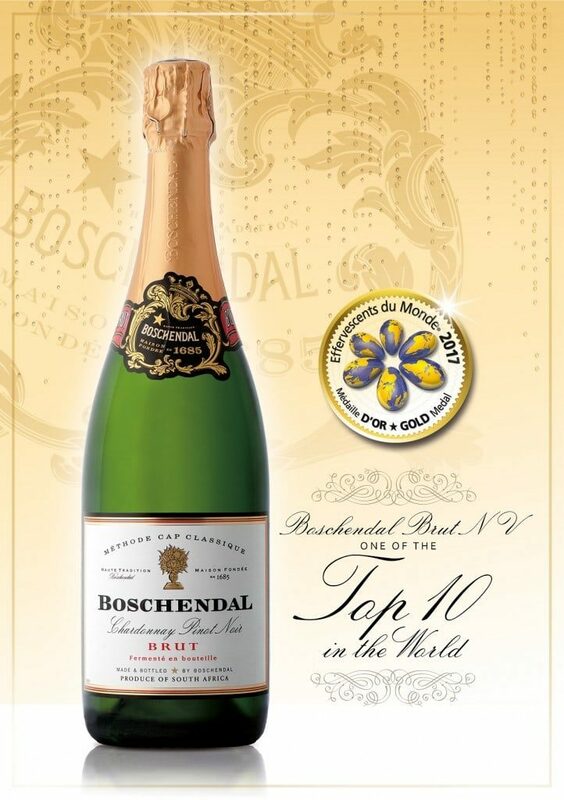 Boschendal today proudly announced that its Boschendal Méthode Cap Classique Brut has been named one of the top ten sparkling wines in the international Effervecents du Monde awards. The MCC Brut faced stiff competition in the prestigious awards – 548 entries were received from 21 countries – and was the only South African wine among the winners. As well as being placed in the top ten, Boschendal’s MCC Brut also won one of only 31 gold medals awarded this year – and was the only South African producer to do so. The accolades are a fitting end to a dazzling awards season during which Boschendal was awarded a total of 135 local and international awards. A highly esteemed French organisation, Effervescents du Monde’s annual competition provides a much-anticipated guide to the veritable who’s who of global sparkling wine producers. Rewarding industry excellence, a panel of over 100 expert judges carefully appraise each entry’s appearance, consistency, foam ratio and effervescent quality. The Brut is made in the classic Méthode Cap Classique style, with early harvesting at a lower sugar level to achieve the desired freshness for the base wine. • After the grapes were handpicked and whole bunch pressed, only the first 500 litres per ton of the juice was extracted before being cold settled for 48 hours. • The clear juice was then racked from the lees and fermented at 16 degrees, following which the tank was filled and left on the primary lees. • After the final base wine blend was stabilised, its sugar level was adjusted, with the adding of the ‘liqueur de tirage’ (yeast) catalysing the second fermentation in the bottle – which is where the magic of the MCC bubble transpires. • This resulted in the very fine mousse that the Méthode Cap Classique is so well known for. A minimum of 12 months maturation on the lees in the bottle followed.